While it is the holiday season, sleigh bells aren’t what lawyers should be listening for as 2016 comes to a close. Instead, the voices of clients should be heard above all the Whos in Whoville. That’s because client feedback is one of the most critical sources of information for a law firm’s marketing and business strategy. When developing strategic marketing plans and tactics for law firms, I have the opportunity to speak with clients of firms of all sizes, in numerous practices and various geographic locations. As I interview these clients, I am looking for insights into why they hired a particular lawyer, what makes one lawyer stand out from others, and what keeps them coming back to that lawyer and/or law firm for solutions to their legal needs. All this information serves as the foundation for formulating a plan. In my two decades of experience in legal marketing, I have heard a litany of comments and a range of suggestions for how lawyers might improve their clients’ satisfaction with their services and be more effective in their marketing efforts. While I encourage you to do your own client inquiries to find out what may help improve the client relations at your firm, I have compiled a roundup of some of the consistent themes I heard in 2016. In-house counsel say they continue to use the Request for Proposal process to hire outside counsel, particularly to reduce the number of outside firms being used or to find highly-specialized solutions. While they have seen improvement in the responses law firms provide to RFPs, they feel that lawyers still do not do a very good job of “getting to the point” and continue to quote billing rates higher than what it would cost to do the work in-house, if the client had the time/staff. I have spoken with hundreds of law firm clients. Only one had anything positive to say about the various rankings a lawyer or law firm holds. The others have said that they pay little to no attention to these and that rankings are not a factor in the hiring process. The primary factors considered in hiring or staying with lawyers and firms remain experience, a valued relationship based on knowledge of the client’s business and industry, timeliness/responsiveness, and fees that reflect true value. Those clients who work with large numbers of lawyers say they are inundated with requests to serve as references for lawyer rankings, but add that they tend to agree to serve as references for those lawyer relationships they value the most. Social Media: Who Has Time? When asked about the marketing activities of the lawyers with which they work, clients continue to value newsletters/alerts, seminars and other information that is succinctly presented, timely and tailored to their issues. The majority of law firm clients indicate they prefer to receive this information via email. When hiring a new service provider, clients say they typically will review a firm’s website. Some also will look at LinkedIn. Younger members of the legal department may use other social media, but general counsel and associate general counsel say they don’t have the time. The clients with whom I’ve spoken over the years have been open, honest and helpful in giving good feedback on their lawyers and law firms. Contrary to what some lawyers believe, clients are not looking for an opportunity to provide negative feedback, but rather appreciate being asked for their input. Most of what I hear from these clients are thoughtful suggestions and a sincere desire to be of assistance. As we go through this season of thankfulness, giving and sharing, perhaps the best gift we can give our clients is to listen. 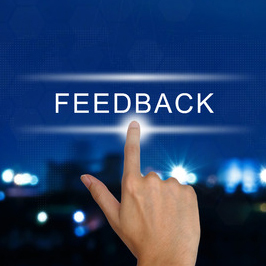 If you have additional comments or feedback or would like information on developing a client feedback program, contact Terry M. Isner at tisner@jaffepr.com.